Millions more are in school but failing to learn because the resources simply aren’t good enough. We won’t stand by and let this continue. At Street Child we are fighting for a world where it is seen as unacceptable for a child not to be in education. Our ‘Count Me In’ appeal ran from November 2018 to February 2019 to raise money to provide more children with access to education and the resources they need to learn ensuring every child has the best chance of success. Donations to our ‘Count Me In’ campaign will be used to help children into education in some of the world’s toughest places through support such as paying school fees, buying uniforms and learning materials, training teachers or refurbishing classrooms and building schools. Education is the single most transformative investment that can be made in a country. By providing more children with access to a quality education we give them better life chances. Beyond providing better employment opportunities, which increase income and reduce poverty, education also supports better health and empowers girls to have a voice in decisions that affect their life. In conflict situations, education serves to promote peace and stability. 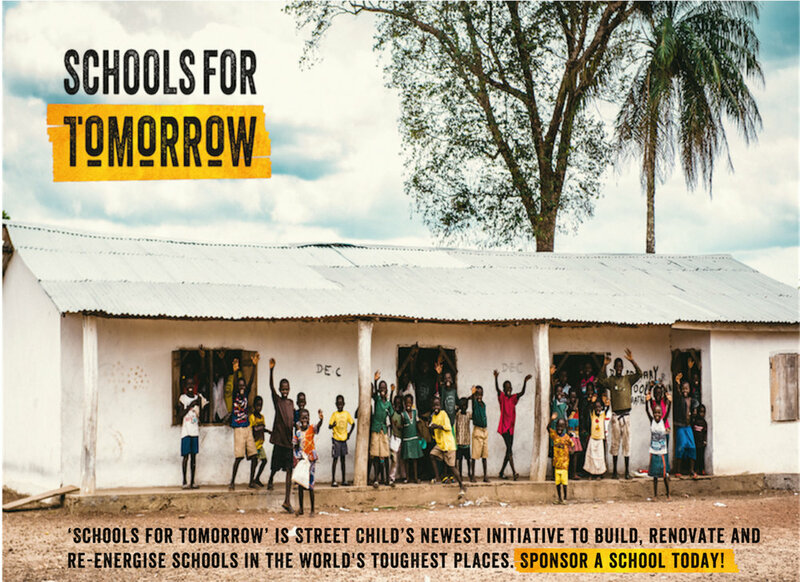 Learn more about how Street Child’s work helps children in some of the world’s toughest places. And watch Sarah, Duchess of York and Tom, our CEO, when the launched the campaign on ITV’s Good Morning Britain.